At age 24, Greg was diagnosed with Polycystic Kidney Disease (PKD). In April 2011, at the age of 50, he began hemodialysis. Greg has been told that his only chance at a healthy life is to have a kidney transplant. 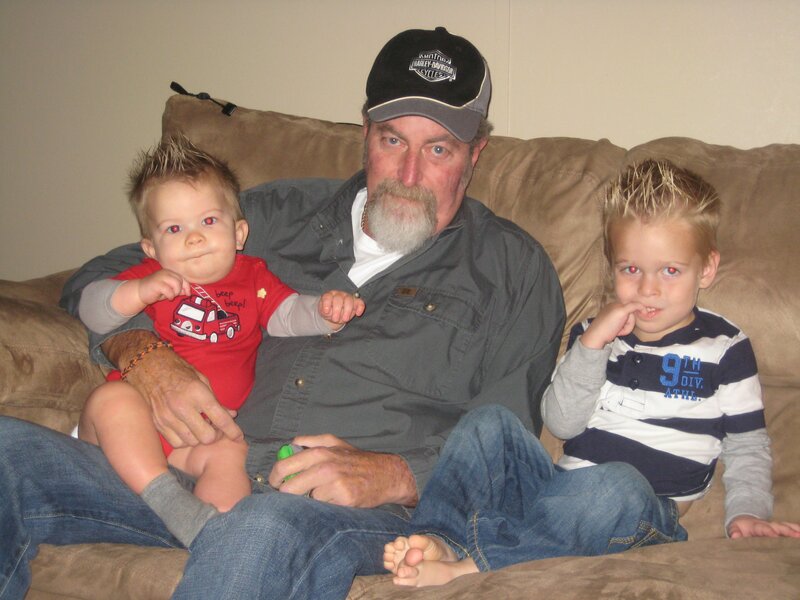 Greg is the father of two wonderful children, Gregory and Jordan; and the grandfather of two precious grandsons, Zachary, age five and Zayne, age three. Even with insurance, Greg will have many uninsured transplant-related expenses such as: co-pays and deductibles, doctor visits and the costly immunosuppressant medications that he will have to take for the rest of his life. Before Greg can be placed on the active transplant waiting list he must raise $10,000. This places a financial burden on our family that we cannot meet alone. To help with these uninsured expenses, a fundraising campaign in Greg’s honor has been established with Help Hope Live, a nonprofit organization that has been assisting the transplant community for more than 30 years. All donations are tax-deductible to the full extent allowed by law, are held by Help Hope Live in the South-Atlantic Transplant Fund, and are administered by Help Hope Live for transplant-related expenses only. Your contribution is greatly appreciated. Your donation will help to improve the quality of life for Greg — please click the DONATE NOW button today. We are going on 3 years now and Greg is doing great. Thanks for all your thoughts and prayers. We are very excited to tell you that on July 26, 2015, Greg received the phone call he had been waiting on – a donor had been identified and he received his gift-of-life — his kidney transplant! . After 5 days in the hospital, he is now at home recovering with his new kidney and a new life. He still has a long way to go but he is doing very well. The transplant team at Wake Forest Baptist Medical Center is absolutely amazing. We will NEVER be able to say “Thank you” enough for your prayers and support. We look forward to seeing everyone soon. GREAT NEWS…effective June 5, 2015 Greg became active on the transplant list. As mentioned in an earlier post, once you complete all the required testing and become active, your time on dialysis will be credited as wait time on the transplant list. Greg has been on dialysis for 4 years and the average wait time is 3-5 years. SO…now we will have a suitcase packed and ready to go at all times. We would like to say “Thank you” for all of your prayers and to everyone who has donated and participated in the fundraising events. As a reminder, all donations are tax deductible and all funds are distributed by HelpHopeLive and goes strictly for transplant expenses. Greg is scheduled to complete additional tests to make sure he is healthy enough for surgery. We were told that they do not see any reason why Greg would not be eligible for transplant. These tests are scheduled for May 19th and May 26th and will include a stress test, vascular, and MRI. We will keep you posted on the outcome. The date for Greg’s testing is fast approaching. He should be able to be placed on the transplant list after this is complete. We learned a couple weeks ago that once Greg has completed his testing and placed on the transplant list, he will receive credit for the four years he has been on dialysis. This was GREAT news. We love you all and I will keep you posted. Funds are being processed for the remaining portion of Greg’s original $10,000 goal. A HUGE Thank You to everyone. Greg is scheduled for April 28 to repeat 3 tests needed to complete his evaluation. Unfortunately, this was the earliest date available. Although this will be an ongoing campaign, this will get Greg on the transplant list and he can begin accruing time. We hope everyone had a Merry Christmas and hope you have a safe and Happy New Year. Thank you again for all of your donations, what a wonderful Christmas gift for Greg to see the total climb so quickly. We will begin working on another benefit soon. Let us know if you have any suggestions. Thanks to everyone who attended the barbecue on November 8th and also to those who could not attend but have made an online donation. There was a lot of delicious food and desserts, and more desserts….Thanks to all of the ladies who did the baking. Thanks to the men who stayed up all night cooking. A big thank you to the local businesses who donated food, chips, drinks and raffle items. With your help, we were able to raise $2600.00 for Greg’s campaign. This will put Greg at about $6800.00, so we will do it again after the first of the year. None of this would be possible without the support of all of you. Pictures from the benefit have been posted in the photo album. Congratulations to Damon Rice, winner of the Yeti cooler, and Anthony Hudnall, winner of the diamond necklace. We would like to say “Thank You” again for your donations. We are almost half way there and it would not be possible without all of you. Some friends are planning a barbecue on November 8 from 2pm until? at First Turn Sports Bar on Hwy 16 in Denver, NC. We are selling raffle tickets for a Yeti cooler and a woman’s diamond necklace. We will also have tickets on the day of the barbecue. First Turn has been kind enough to let us use the Tiki Hut as well as the Sports Bar. We invite everyone to come out and enjoy the barbecue and all of the donated side dishes. Pictures from the “Kidney for a King” benefit has been posted. Click on the album cover to view. I apologize for the delay. We would like to thank everyone who attended the benefit on Sunday October 5, 2014 as well as those who could not make it but have donated online. Rusty Barkley with The Part Time Blues Band brought many talented friends, all of who donated their time as their contribution to the benefit. Thanks to Tyler Hatley and all of the bands and volunteers. All of you did a wonderful job and we love you. Everyone really enjoyed the music and had a great time.The auction was a show itself. We met a lot of new people who had interesting stories to tell. Again, we thank you for your generosity and help to get this campaign off to a great start. Check back later for pictures from the event and we welcome everyone to leave a message by signing into the guestbook. The benefit is fast approaching. As many of you may know, this is a surprise to Greg. We welcome anyone who would like to come out and enjoy a good time and great music. Please feel free to sign the guestbook so Greg can read your entries after the benefit. I love you with all my heart !!!! !